"Easy and fairly quick to make. 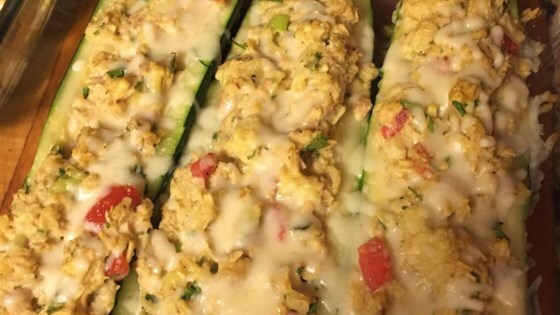 Tuna and zucchini go great together!" Fill a large pot with salted water, place the zucchini into the pot, and boil over medium heat for about 5 minutes to soften. Remove the zucchini, slice in half lengthwise, and allow to cool. Scoop out the flesh from the zucchini halves, leaving a 1/2-inch shell. Set aside the scooped out flesh in a bowl. Place the zucchini flesh into a bowl and mash well. Mix in the tuna, onion, tomato, bread crumbs, egg, salt, and black pepper. Lightly stuff the zucchini shells with the tuna mixture. Drizzle about 1/2 teaspoon of olive oil over each stuffed zucchini half. Bake in the preheated oven until the tops are slightly browned, 20 to 25 minutes. Tried making it with 1 large zucchini. To anyone that does that in the future...skin the zucchini before stuffing and baking it! :) Once the skin was off, it was delicious! I made this for me and my fiancee and we LOVED IT. It was so different but it turned out great. Was Surprisingly quick and easy, baking took the longest and i has it all cleaned up before i even put it in. And Tuna and zuchini definatly tasted alot better than i thought it would woohoo! We liked this -- quick and easy with a "comfort food" feel. I added 1 tsp chili powder for flavor. I did not like this recipe at all. Oh well.